I am so sorry to hear this. I've missed her blog posts and seeing the lovely quilting she did. I had the good fortune to meet her at Little Quilts when I was on a work trip to Atlanta. She was so creative and generous with her talent. I also enjoyed her sharing bits of your life and your service to our country. Please accept my deepest condolences. Your greatest loss is also a loss to many. Your mom was a special lady. Tim, I am so sorry for your lose. Your mother would be so proud as she always was of you that you have taken the time to let us know. I enjoyed reading your mothers post's over the years. Now you take care of yourself and God Bless. I am so sorry for your loss. Your mother will be missed. God bless you and your family. Tim, so sorry to hear of this sad news! She will be greatly missed, as she had become a good friend to many of us through her blog. Our hearts go out to you and your whole family. Tim, I am so sorry for your loss. She was a gifted quilter from which I found so much inspiration. She will be missed by so many. My heart goes out to you. My condolences on your loss. I'll miss reading her blog. Tim, please accept my heartfelt condolences. Your mom was so full of grace. She will be sadly missed. Tim, I'm so sad to hear about the loss of your Mom. My heart is weeping but I know she is pain free now. You were her pride and joy however you were not just her son you were also her friend. Take care of yourself. I'm sorry to hear of your loss, Tim. I've loved reading your mom's blog and I will miss her! I'm so sorry. The quilting community will miss her. I hope you find some solace in knowing how well she was loved. Tim, I'm so sorry for your loss. I miss the frequent email exchanges with your mom and am so glad I had a chance to meet her in person when we took our quilt shop hop through Wisconsin last summer. She was so grateful for the airline ticket you bought her and it was obvious how proud of you she was from all her stories about you. Tim, I am so very sorry to hear this news. Your mom was a great inspiration to many in the quilting and blogging community. While most of us never had the pleasure of meeting your mom in person, her loss will surely be felt because we counted her a friend. But losing your mom is never an easy thing and I want you to know that for as long as you keep the wonderful memories of your mom in your heart - she will be with you all of the days of your life. Her photos were such an inspiration for me. Tim, I'm so sorry for your loss. I enjoyed reading your mom's quilting blogs and her stories about you. My husband is a Marine (retired) so it was interesting to read about you! Take care of yourself. We will miss your mom too. Tim, my thoughts and prayers are with you right now and always. You were your Mom's pride and joy! I sent her the little TV/monitor, just so you know who this is...many hugs to you! Tim, Your mom's posts were always a delight to read and she brought much inspiration to people that loved reading what she had to share. I am sorry for your loss. She will be missed by many. Three angels and an old log cabin, I loved your blog mom. 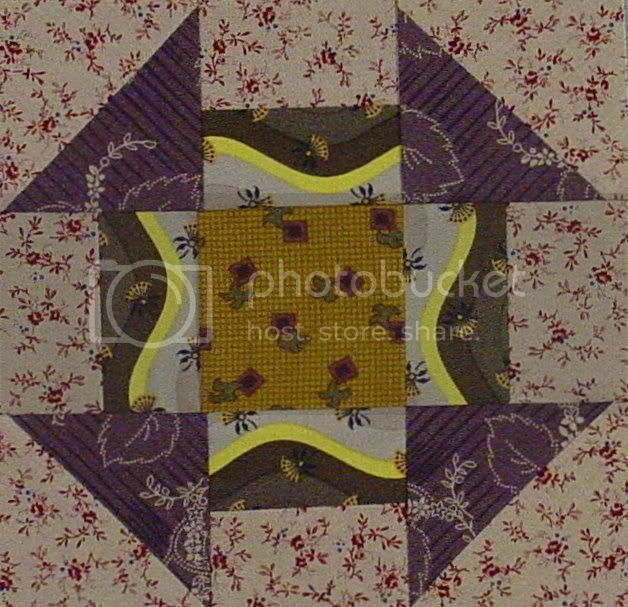 Your mom made her mark in the quilt world and will be missed here in Blogland. I loved her writing the tales of conversations you both had over the years, she loved well! I'm guessing by now your mom has found a heavenly quilt shop and is stitching away with angels. Blessings! Tim, I am so very sorry for your loss. Please know that I will keep you in my prayers for the days ahead. Your mother was a wonderful crafter and gave us so much inspiration. It was a joy to have followed her blog for so long. My heart aches for you as the loss of a parent is never easy. Oh, this is such sad news. I've enjoyed reading your mom's blog for a long time. She was very inspirational and creative, and had such a strong positive outlook on life. She will be greatly missed in our quilting community. Tim, I'm so sorry for your loss. Your Mother will be missed. I will say a prayer for you and your family. Oh I am so sorry to hear this. My heart goes out to you and your family. She will be missed. I'm so sorry to hear of your loss. I'll miss visiting your mother's blog to see her beautiful work. I am so very sorry to hear about your Mom. I love her book and am amazed at her wonderful artistic talent. You and your family are in my thoughts and prayers. So very sorry to hear of your mother's loss. I will miss her posts about quilting and that silly cat Rembrandt. with Deepest Sympathy from "Down Under" for your loss. Thank you for letting us know of your brave mother's passing. She shared so much with us over the years i am sure she will be sadly missed around the world. So so sorry, Tim. Thanks for letting us know. I have thought about her so much. She was a very special lady. I enjoyed her quilts and her blog posts so much. I loved when she wrote about you. She loved you so much. Take care and know that she will be missed. So sorry for your loss. You can see that she had many quilting/blogging friends and we will all miss her greatly. I will miss her unique talent and her stories of you - those stories always make me laugh. She was a very special person. RIP Karen, and take care Tim - she was so proud of you. So sorry to hear of your mom's passing. Know that she and you will be in my thoughts and prayers. I loved reading her blog and looking at her beautiful blocks. She was a true craftsman. I also enjoyed her stories about "Timmy". She has probably found a quilt shop and is fondling fabrics and planning new projects. I'm so sorry to hear this news. She had so many wonderful friends who loved to visit with her about primitive folk art. I wish you peace with her passing. I pray you feel God's comforting arms around you. I'm so sorry for your loss. You're in my prayers. I admired your mom's work very much. I will miss her blog. So sorry to hear about your loss. Your mom was a talented lady in quilting and in so many other ways including a way with words and beautiful descriptive humor. You made her laugh every day and she loved that. She was so proud of you, you are a good son. Have a good life and know she is watching out for you. Karen will be greatly missed. Sorry to hear of your mom's passing. My thoughts and prayers are with you Tim. Tim, I'm so sorry for your loss. Your mom brightened the days of so many and will be greatly missed. I am honored to have known her through her blog. May God comfort you during this difficult time. I'm so sorry for your loss Tim, your Mum was a delightful friend, and I will miss her terribly. Thank you for being such a comfort to her. Very sad news Tim, thank you for sharing in your mothers departure. It is sad and she will be truly missed. Karen will never be forgotten through her quilting community, God bless to you, forever in our thoughts. Thank you for sharing this sad news with us. You're in our hearts Tim, and your mom will be remembered. I am so sorry to hear of your Mother's passing. I so enjoyed her blog, her lovely quilts , and her pride in you always came thru....Thank you for letting us know. It is s hard to loose our Mom. Prayers for you, Tim. Tim, I am so sorry to hear of your Mom's passing. She was a special lady. Thank you for posting this Timmy. i wrote about your mom on my blog today also. just a little, as my heart is full and my eyes blurred. I treasure the friendship that she and I had. We laughed and commiserated, and shared projects and shared feelings. I miss her every day. God bless you. Everyone knows you were her greatest treasure. I am so sorry for your loss. My thoughts and prayers are with you. Your Mom will be missed and you can take comfort in knowing that she touched many of our hearts. Please accept my heartfelt condolences. Your mother was so talented - I loved reading her blog, and enjoyed seeing her quilts. She will be greatly missed. Sad news for all of us who were inspired by her beautiful work. She was always so generous and kind. She will be missed. Thanks for letting us know. May he memory be for a blessing for you. The amazing world of the internet has allowed me to meet your Mum through our shared joy in quilting. Your mother's quilts and writings have given so much joy to others all around the world. Thank you for passing on this sad news and please accept my heartfelt condolences for your loss. This is a very sad post. Thank u for sharing it. I am so sorry that you have lost your mother, I am sending hugs your way. She loved her sewing and her blogging friends. She was loved right back. I am so sorry to hear this! Your mom was such a wonderful lady and I will miss her posts. She was so generous and kind. She was so very proud of you. She will be greatly missed. My thoughts and prayers are with you. Please accept my sincerest sympathy on your mother's passing. Like so many others here, I enjoyed her blog and seeing her Civil War and Grandmother's Choice blocks. She had such a wonderful sense of humor, and will be dearly missed in our quilting community. I hope our thoughts and prayers will offer you some comfort. Hi Tim, This is Betty. Something told me to check your Mom's blog this morning and I saw your post. I know how busy you're going to be and how exhausted you must be now. I wish I lived closer and could offer you some support. I'll miss your mom very much and I won't ever forget her. I'll always treasure the doll dresses she made for my Ginny doll. Know that you are in our prayers. Your Mom was a very special and talented lady! Your mother was such an amazing woman and the blogging community absolutely loved her. We shall miss her more than you could ever know or realize. You need to know that because of her, we got to know you and her deep, deep love for you. We will carry that deep love and that energy from her heart to ours and you will always, always be in our thoughts and in our prayers. Her light is shining still, as is yours, and we will not let that flame ever go out. Keep her in your heart and hear her speak to you there, always. She loved you so, so very much! Tim, I am so sorry. I enjoyed knowing your mom. We took a class together at Little Quilts, had lunch a time or two. We were both school librarians, quilters, and my son was ending his active time in the Marines about the time you were going into boot. I know that you realize she was a special person, but I hope it will warm you to know that many other people recognized her uniqueness and held her in high, warm regard. My prayers for you both. Hello, i am so sorry about your Mom's illness. I have a firm & solid conviction that the Veil is very thin -actually a flimsy film, and our loved ones are nearby watching over us, as they always were. I love this darling Blog and will miss your mom and her lovely posts and quilts. Most of all, i want to say that You are an AWESOME son! My heartfelt sympathies on your loss. Blessings and prayers. Please let me join others in expressing my admiration for your mother. Love to all. I am so sorry to learn of Karen's death. Her book is one of my all-time favorites. My sincere sympathies to her family and friends. I am so sorry to hear this Tim. My thoughts are with you and her friends. I know she will be dearly missed. I always enjoyed reading her blog. Please take care. I am so sorry for your loss Tim! Thank you for posting and letting us know, I have been checking to see if she had posted anything. I so enjoyed reading your moms blog and she talked of you so often. Your mom will be greatly missed by so many people that she didn't even know, I will keep you and your family in my prayers. God Bless! Words are hard to come by but please know like everyone else, I am so sorry for your loss. Our folk art quilting community lost a lovely talent in Karen. I'm so sorry for your loss. My thoughts are with you. In the first years of blogging by your mom and me she saw a picture of my daughter on my blog. She made a drawing of it and we were so lucky that she send us her drawing. Isis (my daughter) will treasure it forever. She loves it. She was shocked when she heard this sad news. She gives you her sympathy on your mothers passing. Your mom was an excellent quilter. Her inspiration will continue by her patterns and blog. She was also an excellent painter. Your loss is also quilting and a sad loss for quilters everywhere.....although I did not personally know your mom, she was an important part of my virtual world.....and I will miss her. Tim, I am so heartsick to hear this. She has been on my mind and in my prayers daily. I know heaven must be a brighter spot with her sweet spirit. I will add you to my prayer list too. We all fell in love with her stories about you, your time in the service, and the cute photos and stories of Rembrant. I met your mom once at the quilt shop but did not know her other than through the blog. She had a deep love for quilting and was very good at it. Peace to you. Your mom gave all of us a lot of Joy. I hope you can find some peace in all of this. I am sorry for your loss and Our Quilting Loss. I followed your moms blog for a long time and very sad to hear the news, glad you were there with her. I have held her & the family in prayer. So so sorry to hear this news. I really enjoyed reading your mothers blg. Tim, I've been reading your Mom's blog for so long that I felt like I knew her. I'm so sorry for your loss. I'm glad she had you there with her. God bless. I'm so sad to hear of Karen's passing. She was so supportive of me while I was working on my version of her book and so sweet to take the time to encourage me along. I will miss hearing from her and I'm sad that she is gone from all our lives. I loved reading her blog and always looked forward to her creative adventures in quilting. My deepest condolences to you Tim, your Mom was a great lady and she will be missed. Please know that you and your family are in my prayers. I 'met' your mom in 2010 when we became obsessed with a little white bone dish on Blackbird Designs home page. I found two and sent her one. She showed it in a post on January 30, 2011. We talked about lots if things -- I think she was from indiana which is where I live. I was working at a middle school so we kvetched about education issues (we agreed on them!). Life went on and we lost touch -- I read the little quilts newsletter telling about her passing. I'm so sorry -- I know words are so inadequate. But I do know she was so proud of you. Thank you for taking such good care of your mom. As a mother of five, I know we moms cherish our kids and when they're nice to us, that means a lot (mine range from 29 to 18 so I get an assortment of responses from our kids). Very sorry for your loss. She was a talented quilter and a very nice lady. I so enjoyed looking at the projects she was working on and showed in her blog. This is very sad news. Gosh I just feel so sorry for the loss of our quilt friend and inspiration. I loved seeing Karen's blocks for the Suffragette project (as she called it). She is such a creative person and her blocks were just absolutely incredible. I am teary thinking that her Votes for Women project will not be completed. The quilt blog community will miss her greatly, but not nearly as much as you will. Sending you and your family big quilty hugs from Canada. My deepest sympathy to you and your entire family! Timothy, I'm so sorry for your loss. Your mom was an amazing quilter and her blog is a joy to read. I hope her quilts bring you comfort. Remember the good times you shared. She will be missed. I am so sorry to hear this news. Your mom was a wonderful lady, and I really enjoyed reading her blog. My prayers are with you. Tim, I am very sorry for your loss. My heart goes out to you, and you are in my prayers. Your mother was a wonderful and inspiring quilter, and she was always very proud of you and loved you so much. She will be missed, but also often remembered through her lovely book. Tim, I am so sorry to hear this. I loved reading the blog and will miss your mom so much. I am so sad. Karen was wonderful sharing her time and talent. I will treasure the project she helped me with. I will miss her. My deepest condolences to you Timmy and Rembrandt. Oh Tim... I am so sorry you have lost your Mom. I became "acquainted" with her thru her wonderfully creative Barbara Brackman civil war blocks. Her blocks were just perfect with the pictures. I was in awe looking at every one. She was a very brave lady and obviously proud of you Tim. Hold her memory close to your heart and you will never lose her. So sorry for your loss. She will be missed!